Many Washington Semester Program (WSP) alumni eventually find their way back to DC, and some even find their way back to American University (AU). 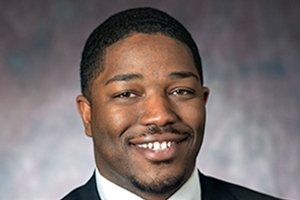 That was the case for Kerwin Henderson, a current Research Associate in the Justice Programs Office of Public Affairs at AU, who completed the WSP with a concentration in justice and law in the Spring of 2011. "I had a phenomenal experience in the program," Henderson announced. "It exposed me to the full spectrum of the criminal justice system, and through my experience, I gained an understanding of how the system works." While he participated in the WSP, Henderson interned with the Office of Community Orientated Policing at the Department of Justice and was able to meet a number of influential people in the local DC and federal governments. He recognized that he would not have had the opportunity to gain firsthand experience at a federal agency if he had not participated in the program. Henderson states that the program helped him become an advocate for criminal justice reform. He says that the program prepared him for his graduate school experience at the University of Cincinnati, where he earned a master's in criminal justice. "My experience in the program has helped me in every professional position I've held since graduating from grad school," said Henderson. "I've worked as a practitioner at a children's home and as a researcher in academia, and the broad experience I was afforded in the program helped me excel at both." Like many other WSP alumni, Henderson recognized the invaluable experience he received through his participation in the Washington Semester Program. He commented that it is rare for a program to have both a rich learning environment and the opportunity to intern at influential institutions. "Prospective students should not pass up the opportunity to participate in the program."